At that time we were excited to note that the majority of traffic on these networks to major Internet content sources was now being transported over IPv6. As we start another year for IPv6 deployment and measurement we thought it would be timely to take another look at the state of IPv6 deployment in this segment. The graph below shows the progress of the aggregate metric for IPv6 deployment in these four networks over the last two years. This is really striking and consistent progress since we last reviewed the situation, and the growth of IPv6 deployment in 2018 across all network types and geographies is showing no signs of abating. Check out the full listing of newly updated IPv6 network operator measurements for this month. If you’re a network operator deploying IPv6 and would like to join these cellular networks and the other networks that make up the ranks of World IPv6 Launch participants, please register your network for measurement. 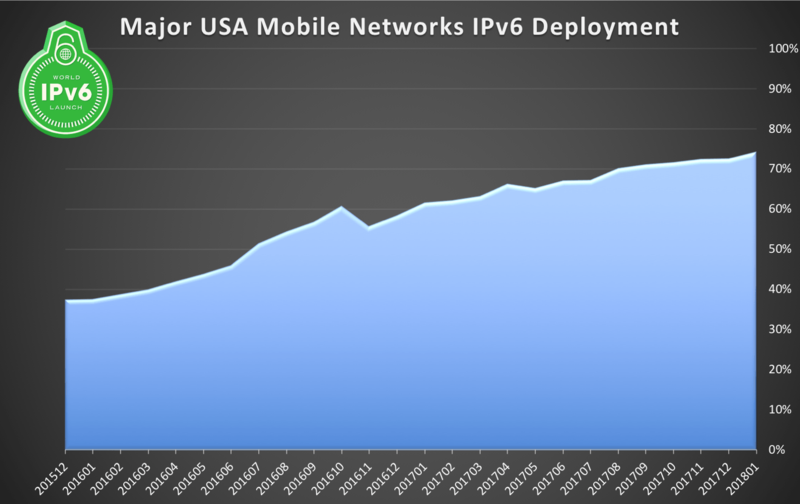 It’s great to see major network operators continue to deploy IPv6 and continue to register with World IPv6 Launch to have public acknowledgement of the scale and scope of their efforts. This month’s IPv6 network operator measurements include a couple of new entrants that I’d like to highlight in this short post. ER-Telecom is a Russian telecommunications holding company providing a wide range of services for individuals and corporations. The company is active mainly in the South and Central regions of European Russia. This month’s IPv6 network operator measurements show ER-Telecom ranked 49th with an IPv6 deployment percentage of 10.34%. Bell Mobility is a Canadian LTE and HSPA+ based wireless provider which sells wireless services across Canada. Bell Mobility and its affiliates combined have over 8 million subscribers as of the end of Q3 2016, making it Canada’s third largest wireless carrier. This month’s IPv6 network operator measurements show Bell Mobility ranked 73rd with an IPv6 deployment percentage of 17.54%. If you’re a network operator deploying IPv6 and would like to join ER-Telecom, Bell Mobility and the other networks that make up the ranks of World IPv6 Launch participants, please register your network for measurement. I always like to highlight new operators turning up IPv6 in these regular posts and it’s great that I can do that again this month. 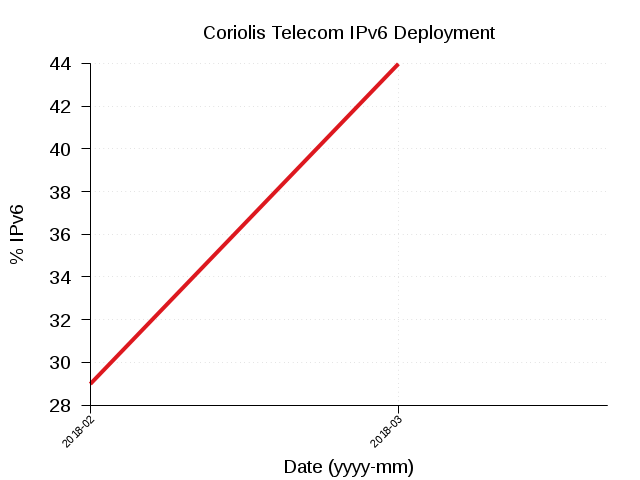 VNPT registered with World IPv6 Launch in May of this year and are now growing their deployment rapidly (latest measurements show more than 4% IPv6 deployment). Vietnam Posts and Telecommunications Group, commonly abbreviated as VNPT, is a telecommunications company, owned by the Vietnamese government, and the national post office of Vietnam. VNPT owns Vinaphone, one of the three largest mobile network operators in Vietnam. If you’re a network operator deploying IPv6 and would like to join VNPT and the other networks that make up the ranks of World IPv6 Launch participants, please register your network for measurement.